Kings Kaleidoscope will perform at Grace College on September 8, 2017. Kings Kaleidoscope, an alternative Christian band based in Seattle, Wash., will perform at the sixth of seven concerts in the second annual Grace College and Village at Winona Festival of Music. This dynamic concert will take place on Friday, Sept. 8, at 8 p.m., in the Winona Heritage Room, 901 Park Ave, Winona Lake, Ind. Tickets, $10 for adults and $5 for students and seniors, will be available at the door. Grace College students and their siblings may attend for free. Kings Kaleidoscope has released four partial albums, including “The Beauty Between.” The band builds upon the mainstay sounds of drums, bass, keys, and guitars. Then they add a vast array of orchestral elements including violins, cellos, woodwinds, trombones, trumpets, and vibraphones. 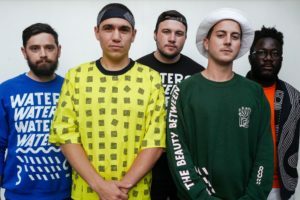 Kings Kaleidoscope boasts a strong hip-hop influence and an energy that nods toward The Mars Volta. The band’s self-prescribed “designed chaos” combines high energy musical exploration with classic style hymns and modern anthems. The second annual Festival of Music is sponsored by Grace College, Wagon Wheel Center for the Arts and The Village at Winona. For more information on all planned events, visit grace.edu/musicfestival or contact festival coordinator Walter Brath at brathw@grace.edu.